I really like the emerging continuity between the entries in this site. You’re giving a good sense of context and historical interest to what would otherwise be disregarded as boring wasteland. Great job, I’mm looking forward to future installments. Hehe – wait until you see the eBook that I’ll publish when this series of articles is complete! In fact, if you come and visit, fancy helping me design it? Much of the canal bed south of Merthyr was used to carry a water main serving Cardiff, hence the non-development. Re. the section south of Abercynon, there is in fact a long length, about 1 km, still in existence. It runs alongside the A470 north of Cilfynydd. Thanks for thos description of the Brown-Lenox site. I’m related to Samuel Brown and hope to visit his industrial site one day! 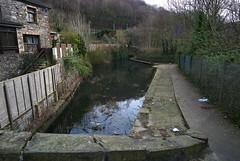 Sadly the site was cleared towards the end of 2009; the canal basin is now the only reminder left of the Brown Lennox works. Apparently Bath Green Park station was converted into a shop by Sainsburys. They have not done the same with Ponty. But what do you expect with a Bristol architect, although they are not keen to publish the connection. just for your info if you go to nantgarw china works and walk up the tow path to the north of the bridge, past the cottages the road ends burt if your not worried about fences and brambles you can gain access the a pretty long section of the canal route – none holding water but distint in places as it runs parallel with the A470 through a belt of un managed woodland – if my memory serves me correctly there is even and intact bridge along this section – i used to work as caretaker at the china works museum so had the fortune of gaining access through the woodlands to the rear of the site – doubtless long trousers and slasher expedition now – there is also still the remains of a canal barge in canal within the grounds of the museum, abandoned i’m led to believe when the canal closed – there are photos in the museum to show its exact location. hope that sof interest . Thank you – I’ll definitely have to go looking for that.